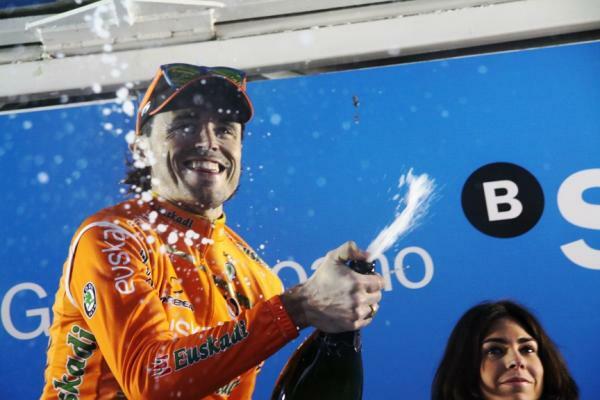 This week sees the 59th running of the Tour of the Basque Country (Vuelta al Pais Vasco) and we’re not there, again! We’ve watched this stage race continuously from 2011 but were forced to miss the last two years’ because of issues with my beloved’s hip. It’s now happily mended but sadly pressure of work has prevented the resumption of our visits. To console myself, I thought I’d write a bit about this year’s race which started today. As you all know, I love the race’s location. The Basque Country is famous for its sunny beaches, scintillating modern architecture and for its feisty, cycling-mad natives. It’s also simply beautiful: bright white chalet-style homes with deep-red, blue or green shutters scatter across lush, rolling hills; the Pyrenees Mountains soar high above the Atlantic; and surfers and sardines share the waves. The dazzling architecture of the Guggenheim Bilbao modern-art museum and the glittering resort of San Sebastian draw enthusiastic crowds, while traditional small towns, such as Lekeitio and Hondarribia, are also thriving, making the entire region colourful, fun and welcoming. The race route (in red above) typically covers a significant part of the Spanish Basque Country visiting some old favourites, such as its capital Vitoria-Gasteiz and the climb to Arrate from Eibar. But none of it’s ever too far away so it’s possible to base yourself in one hotel and travel daily to each of the start and finish lines. 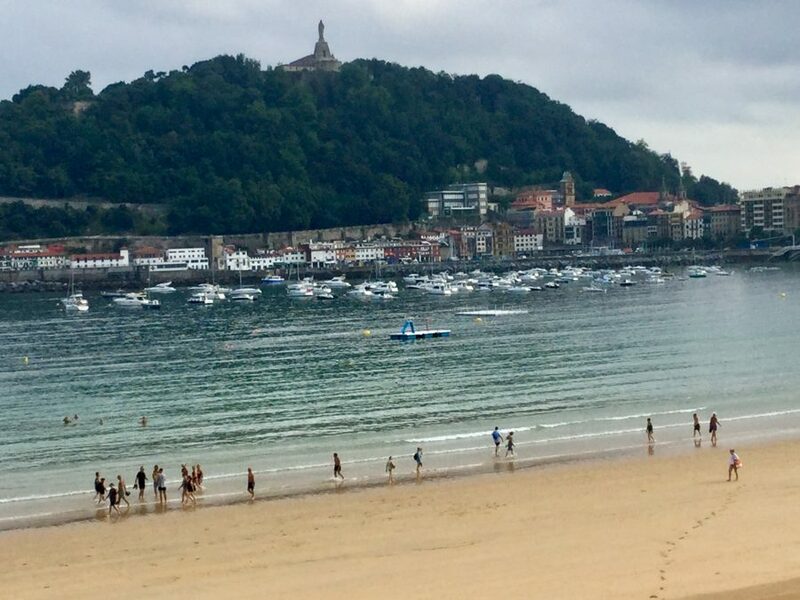 To watch the race, we’ve peviously stayed in some lovely locations such as Getaria, a small fishing resort on the coast not far from San Sebastian. And we’ve stayed inland among those dark satanic hills. But, wherever we’ve stayed, Basque hospitality has been delightful, plentiful and very reasonably priced! This year’s race kicks off in Zumarraga, as it did back in 2011, so it’s a place we’ve visited a few times. In the town centre, there’s the charming arcaded square in the middle of which is a bronze statue dedicated to Miguel López de Legazpi, conqueror of the Philippines. Those Basques sailed everywhere! 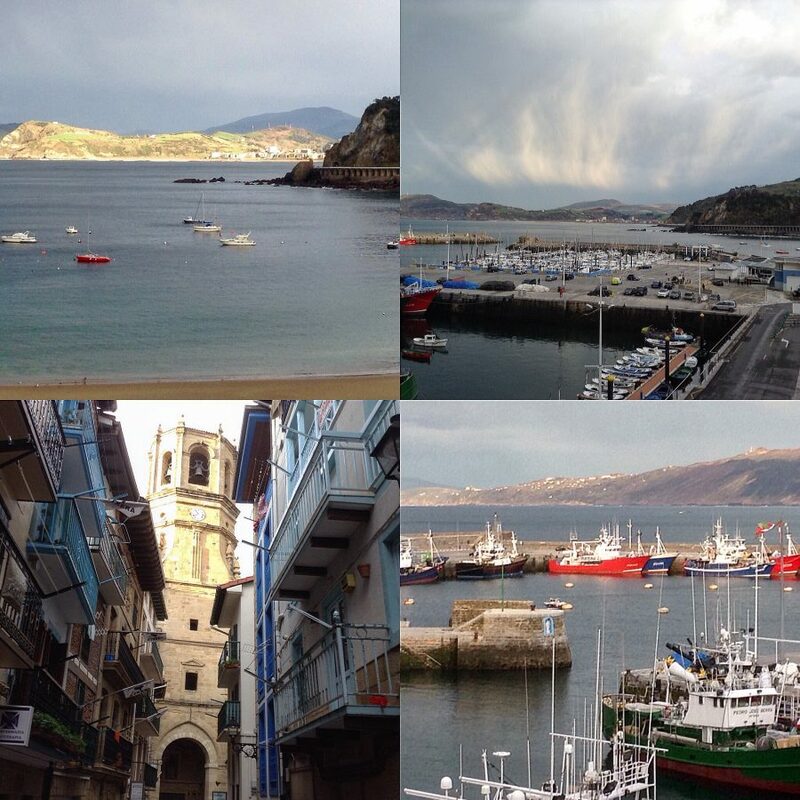 Plus, there’s a 19th century neo-classical town hall, the Itarte and Uzkanga houses, and a16th century Gothic church, Santa María de la Asunción. Interestingly, this year’s race begins (rather than concludes) with an individual time-trial which will be short (11.3km) but intense because the final 2.3km has an average gradient of 9.7%, reaching a maximum of 21% in the final 100 meters. This is pretty typical of climbs in the Basque Country, short but rarely sweet! As is customary, the second stage starts where the first one leaves off in Zumarraga, finishing 150km or so later in Gorraiz after 4,800 metres of climbing. There are hardly any flat roads in the Basque Country – I speak from bitter experience. 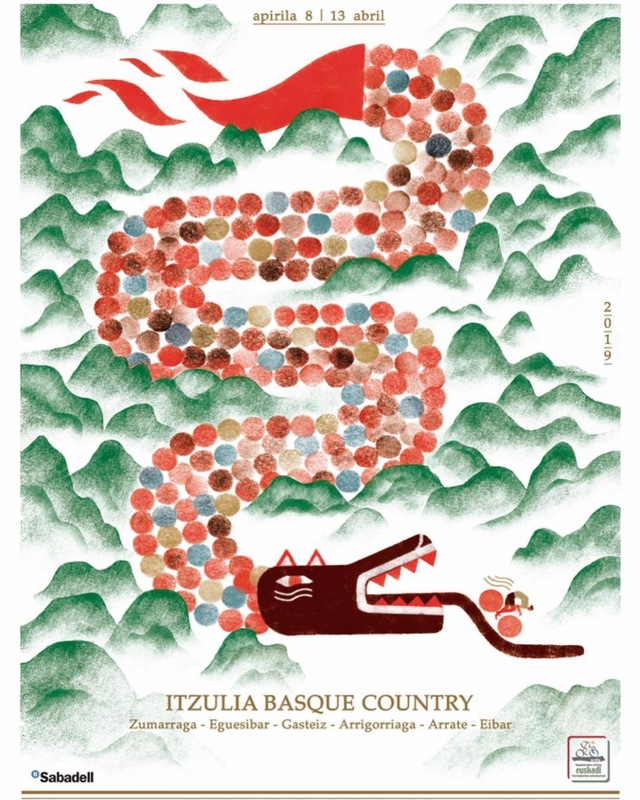 Gorraiz is in Navarra, not too far from its main town of Pamplona. 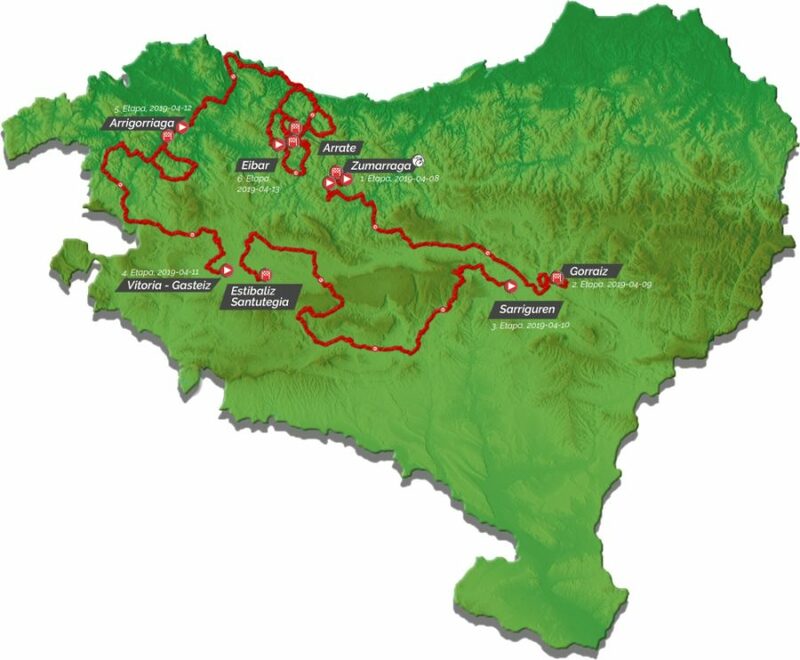 Typically, the parcours visits all the autonomous community of the Basque Country plus the Foral one of Navarra. 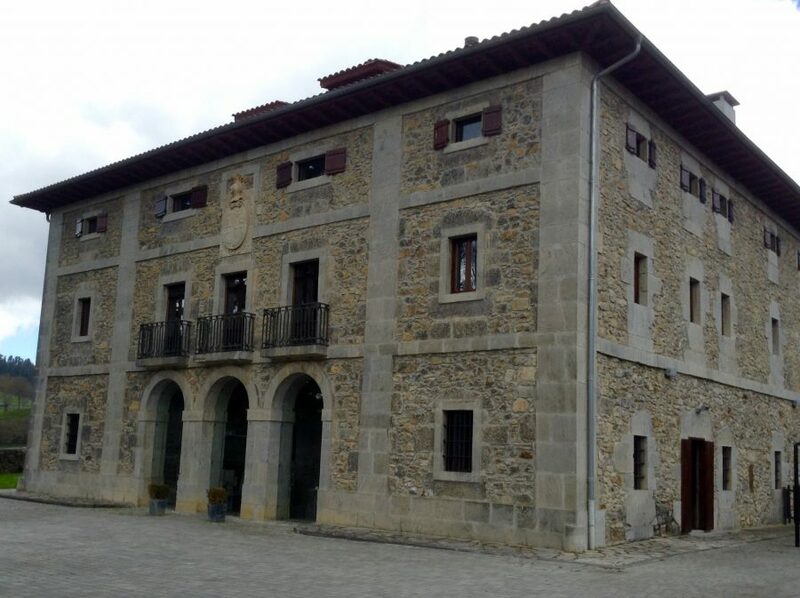 We’ve never visited Gorraiz but I suspect it has been included on the parcours to showcase its its recently rebuilt 16th century palace and church of San Esteban (pictured above right). Day three starts at one of yesterday’s sprint points, the ancient town of Sarrigurenat which is now home to an EcoCity dedicated to preserving the ecological habitat of its surrounding plains. 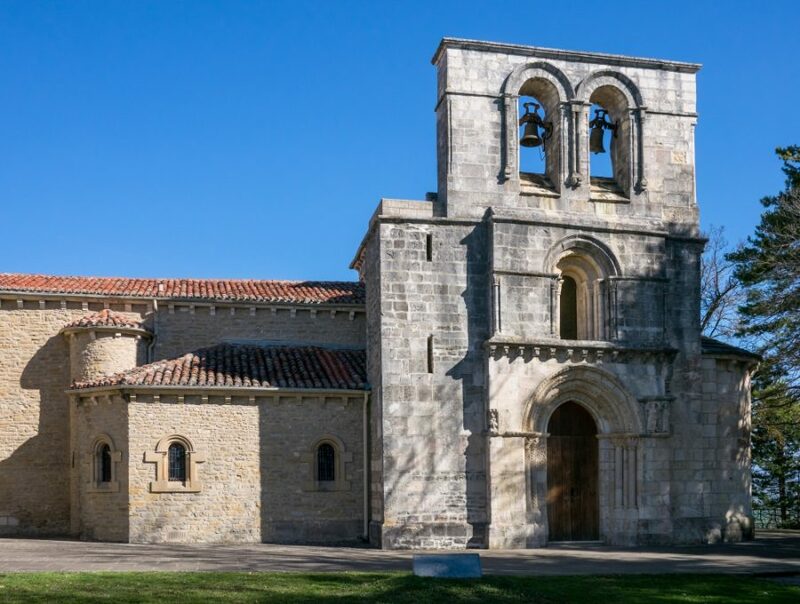 It’s the longest stage of the race with an undulating 191km finishing at 12th century Romanesque Estibaliz Sanctuary (above), dedicated to the patron saint of Álava. We’ve not previously visited either of these towns, although we’ve cycled around Navarra, watched the start of the Vuelta a Espana in Pamplona and seen the GP Miguel Indurrain in Estella several times. The fourth stage starts in the capital of the Basque Country, Vitoria-Gasteiz which has a simply lovely Old Town with some of the best preserved medieval streets and plazas in the region, plus two cathedrals. The stage, another undulating one, finishes in Arrigorriaga, a small town just outside of Bilbao, which has a parish church dating back to 9th century. While, we’re very familiar with Vitoria-Gasteiz, I don’t recollect ever visiting the finish town. The event now starts to hot up with what is often its race defining penultimate stage, finishing in Arrate. Just look at the snaggle-toothed race profile, those boys are going to have weary legs! We’re back on very familiar territory [to us]. The entire final climb will be lined with enthusiastic and knowledgable Basque cycling fans, most of whom will have ridden up the ascent. I have to hold my hand up here and admit we always drive up! I can still remember Samu Sanchez winning here in 2012, his third consecutive win on this climb, before going on to lift the overall. Though possibly the most entertaining victor at Arrate was Diego Rosa who in 2016 lifted his bike aloft before soloing across the line on foot! The final day has only six summits (gulp) and will be raced around Eibar, so often the concluding town for this event. It’s a pleasant place to potter around while the riders are cresting those climbs though much of it has been rebuilt since being destroyed in the Spanish Civil War. It was formerly known for its armaments industry many of whose companies, such as BH and Orbea, now manufacture bikes. So, there you have it: 784kms over six stages which include an individual time-trial and tackle 22 summits. I’ve no idea who’s going to win this year’s race. It’ll have its usual sprinkling of mountain goats and Basque riders. The locals will be hoping that one of the latter manages to climb atop the podium, preferably onto the top step. It’s a race much prized for its tough parcours and ability to get riders to peak for the Ardennes Classics or in form for the Giro d’Italia. I have friends riding so I’ll be watching the race every day on the television and cheering them on – aupa!